Barbara Baynton (1857-1929) was born and grew up in the Hunter Valley region of NSW, well watered farming country a couple of hundred km north west of Sydney, but in her late teens began working as a governess further out and in 1880 she married Alex Frater, older brother to some of her charges, and they took up a largely uncleared property near Coonamble in western NSW, “the nearest neighbour a day’s ride away.” Frater was often away and eventually he ran off with Baynton’s niece who was helping in the house, leaving Baynton with three children to support. Over time, Baynton got a divorce, moved to Sydney, married Dr Baynton and so on (more here) and began writing, under the influence of the Bulletin’s AG Stephens. The intense isolation and fear that Baynton felt, alone in the bush in the outback, is reflected in all her (relatively few) stories, and it is often remarked what a bleaker view she brings to the mostly male Bulletin school with all its mateship and good cheer in adversity. 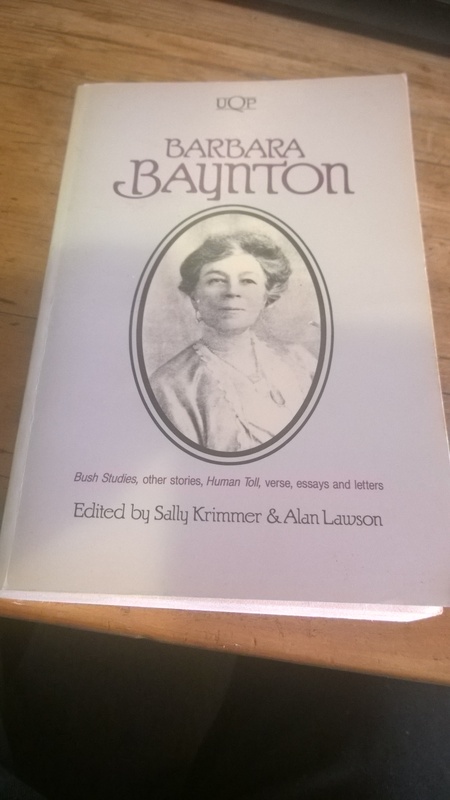 By 1909 when her only novel (or novella, it’s 180 pp), Human Toll was published, Baynton was a widow, living in London. Stephens was not available to provide advice or editing as he was for Bush Studies (1902), her earlier collection of short short stories, which I think had all appeared in the Bulletin during the previous decade, and this might account for the structure of the story being relatively difficult to follow, although individual passages are often excellent. Human Toll commences with a little girl, variously Lovey, Ursie and Ursula, already motherless, coming to terms with the death of her father. She is on a remote, semi arid sheep property in the care of her father’s mate Boshy and an Aboriginal couple Nungi and Queeby. Boshy wishes to continue as the girl’s guardian but their nearest neighbour – yes, “a day’s ride away” – Cameron and his daughter Margaret come and take her (and all the father’s papers). Ursula is sent to Cameron’s sister, a widow in a small country town, who also has the care of Cameron’s son Andrew, a few years older than Ursula, to attend school. The widow marries a grasping Presbyterian preacher, Mr Civil. Andrew often has to stand between Civil and Ursula when the former is handing out punishments. Boshy sometimes comes to town and later provides the money for Ursula to attend boarding school. Mrs Civil dies and Civil becomes ‘nicer’ to Ursula when he thinks she might inherit her father’s property (which Cameron seems to have taken over), or Boshy’s mysterious “fortune”. Spoilers: It all comes to a head at a town dance when Andrew ignores Ursula, gets drunk, and in the morning is found to have “married” Ursula’s friend, Mina. Mina is thrown out of home and Andrew and Palmer, his brother in law, take the two girls back to the original property (where Nungi now has a new and less amenable wife). There the two young woman – with no love at all lost between them – are abandoned; Nungi refuses to continue seeing to the sheep; his new wife is of little assistance around the house; Mina has a baby which she attempts to kill; Ursula runs off with the baby and becomes hopelessly lost in the bush. He advanced to her, misled by her passiveness. She aimed a heavy blow at his leering face with the candlestick, but he dodged it, and, terrified of a noisy scene, he rushed to his room. Then Neddy Neale, dragging his dazed partner, swished past where Palmer and Ursula stood. Gus Stein, with Pat the Jew’s daughter and Andrew with Mina, still kept the floor, but now the rat-tat-tat accompaniment knuckled from the bottom of a tin dish by Dave Heeley, Neale’s drover mate, till, tired out, even he ceased. Then the dancing husband of the singer, importuned, momentarily disengaged his partner to grab his concertina, and with this resting on the girl’s back, he kept the dancers going, till he, though much encouraged, wearied. Dry-throated and panting, some of the wine-maddened performers tried to hoarsely bellow independent tunes, which in turn yielded to impotent yells. The one great difficulty is that throughout, all speech is rendered as dialect, and between a childish Ursie, the Aussies, the Aborigines and the Germans, this is often quite hard to follow. Baynton was a writer for only a brief period of her life, and this is a shame. She apparently commenced another novel, a comedy of manners set in England, which would at least have provided an interesting contrast to her earlier work, but it was never published.